For the most part, I've stayed away from the glitzy and super-rare relic and autographed cards, and stuck to the more common and easily achievable base and insert cards. I also grouped a bunch of cards together because there were too many cards to chose from and I just loved far too many of them. 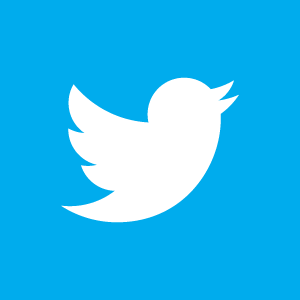 So, in reality this list includes more than just my Top-10 favorites. Also, at the very bottom I included some "Honorable Mentions" that barely missed the cut. I thought I'd begin with this perfectly designed card. Shown below is Panini's 2015 Black Friday "Panini Collection" card made available only through special packs handed out at local card shops on that most hated of all shopping holidays. 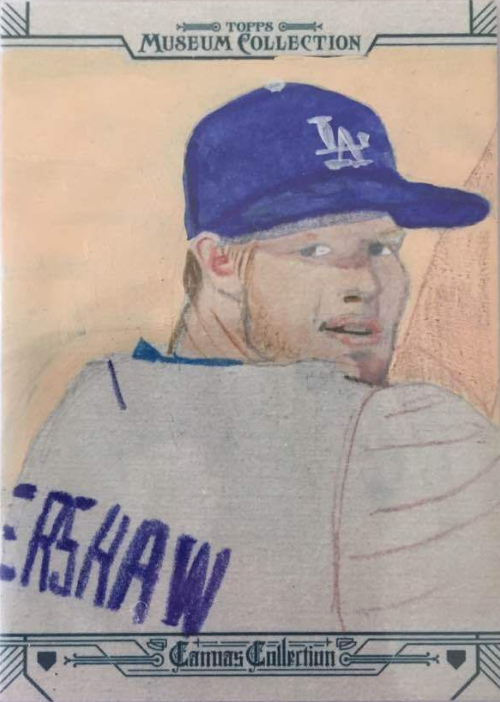 It features Clayton Kershaw and is beautifully framed within black shadows. 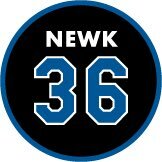 This card is so well done, I don't even miss the fact that there are no team logo's to be found. It just doesn't matter. 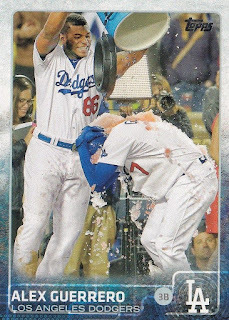 I am a sucker for cards featuring ballplayers celebrating; especially if it includes one player pouring ice and Gatorade on another. Below is Alex Guerrero's 2015 Topps Update card, and Yasiel Puig is seen giving him the walk-off treatment. 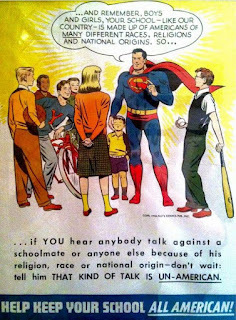 Best yet, this isn't even a short-printed variation. This is his normal base card in the set. 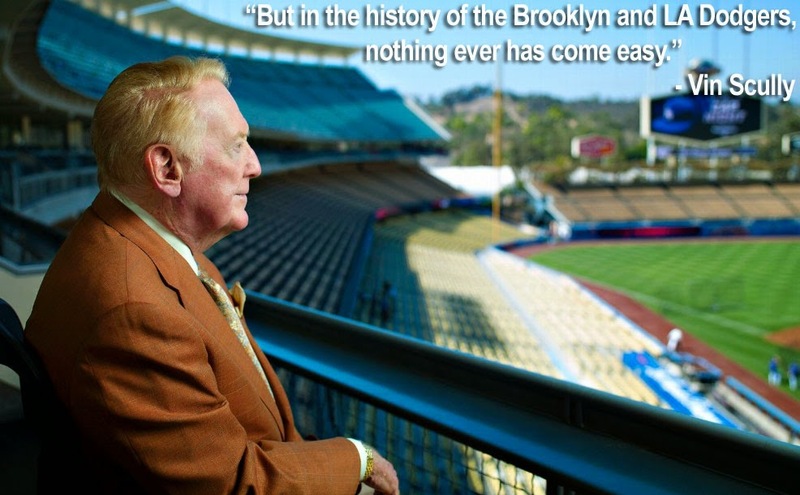 BTW, this photo was taken at the conclusion of an Monday evening game at Dodger Stadium on April 13, 2015. It was an extra inning affair against the Mariners. Guerrero came up to the plate with the bases loaded and knocked home Andre Ethier to win the game. You can also watch the ceremonial dunking on youtube, here. 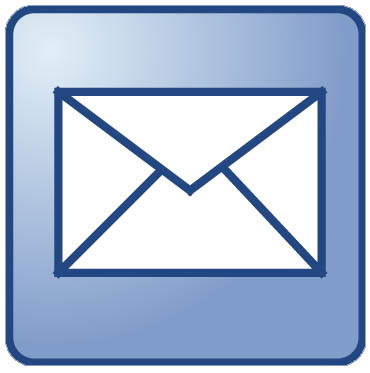 We now come to my first grouping of cards on this list. Featured at #8 are two of the "MLB All-Star Access" insert cards found in packs of 2015 Topps Update. I think you'll agree with me that both of these cards deserve mention. 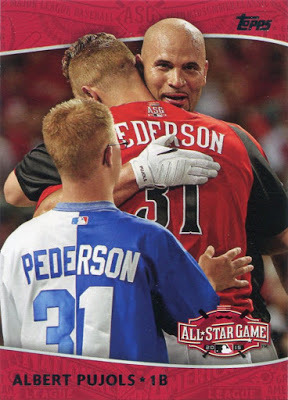 First, here is Albert Pujols' card that happens to feature both Joc Pederson (that years Home Run Derby runner-up) and his brother Champ Pederson (in the foreground). As you may know, Champ has Down Syndrome and his favorite player (other than brother Joc) is Albert Pujols. Not because his rakes (though, he does do that), but because Albert is such a giving person. His daughter Isabella also lives with Down Syndrome, and through his Pujols Family Foundation he has raised funds and created programs that bring about awareness and provide hope for those with Down Syndrome. 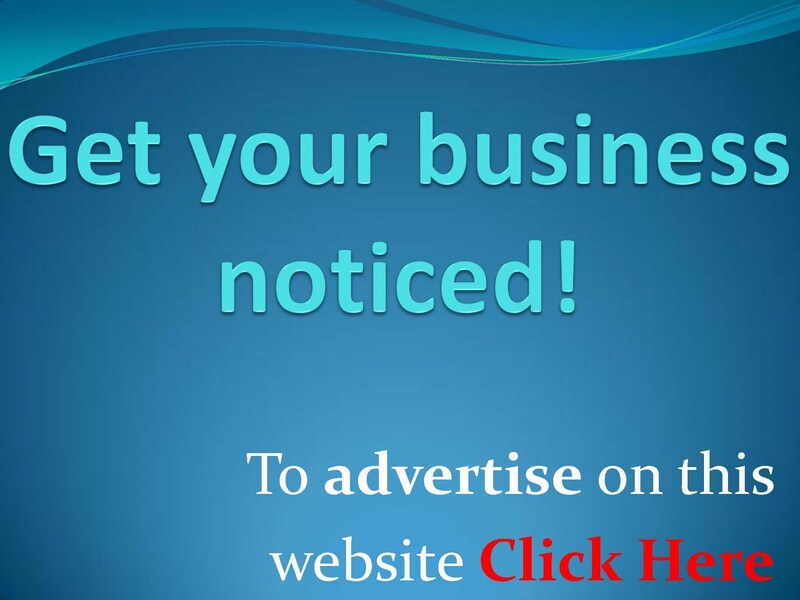 Go here to learn more about his foundation. Sharing the #8 spot with the above Pujols card is Clayton Kershaw's "MLB All-Star Access" insert card below. 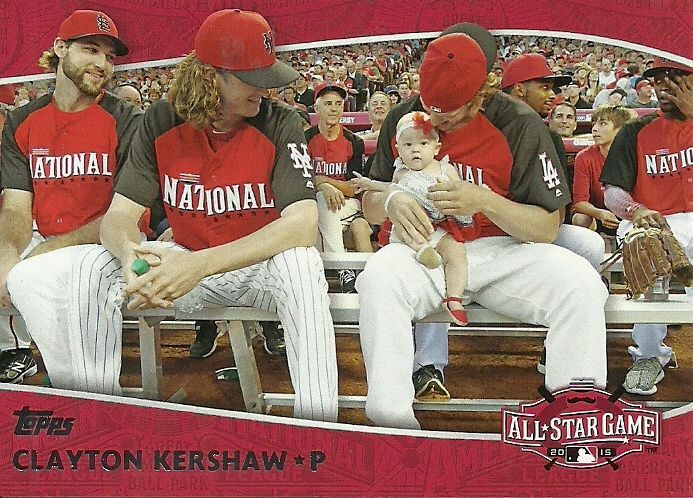 It features Kershaw on the bench with his adorable daughter Cali Ann. On a side note, if she were to ever become famous this card would basically be her rookie card. 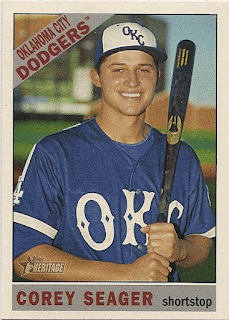 This list wouldn't be complete if I didn't include fast rising rookie Corey Seager. Fortunately, the 2015 Topps Heritage Minor League card (a short-printed high number) features him in an fantastic looking Oklahoma City Dodgers uniform. Those are some fine duds. Don't think for a second that the Kershaw card featuring the team celebrating their 2014 NL West Division clinching victory missed my attention. Shown below is Clayton's 2015 Topps Opening Day base card. BTW, it is a short-printed photo variation. This photo was taken on September 24, 2014. 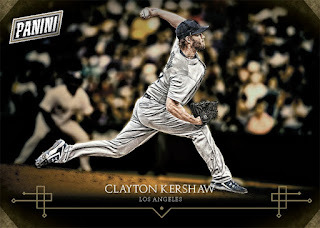 Sharing space at #6 is Kershaw's "Team Spirit" insert card from the same day as the above card. This time, Clayton is sporting the NL West Division Championship t-shirt while waving to the fans. The final pairing of cards on my list highlight Josh Beckett's only Major League no-hitter that he threw against the Phillies in Philadelphia on May 25, 2014. The first card is from the Topps Series 2 flagship set. This second card is probably the better of the two. 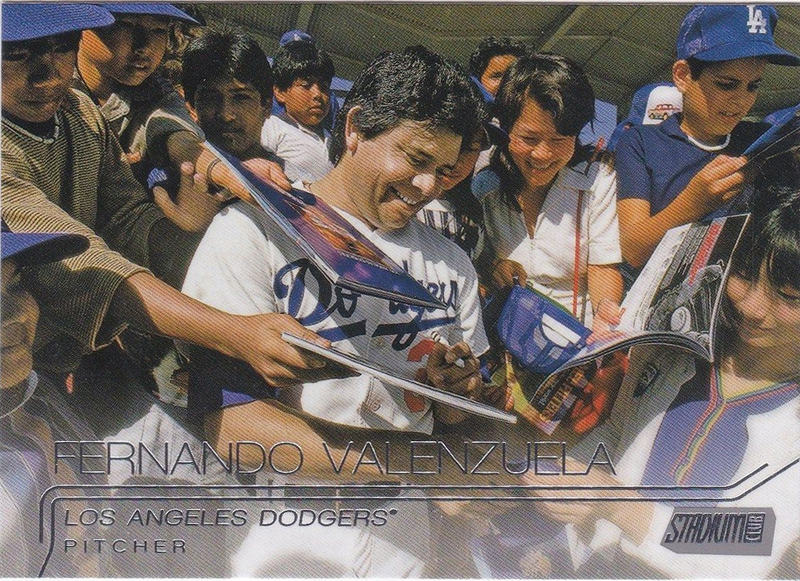 Below is his base Stadium Club card featuring him being engulfed by a crowd of jubilant Dodgers'. This is a card that uses a fantastic photograph. 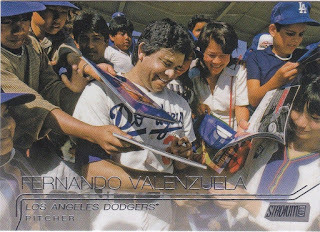 Featured below is Fernando Valenzuela's 2015 Stadium Club base card. As you can see, a young Fernando is surrounded by a legion of fans. The photo itself is undated. BTW, when ever I think of this card I like to imagine myself as one of the young chaps standing behind him - yearning for his scribble on a program. Of course, I had to include this card. 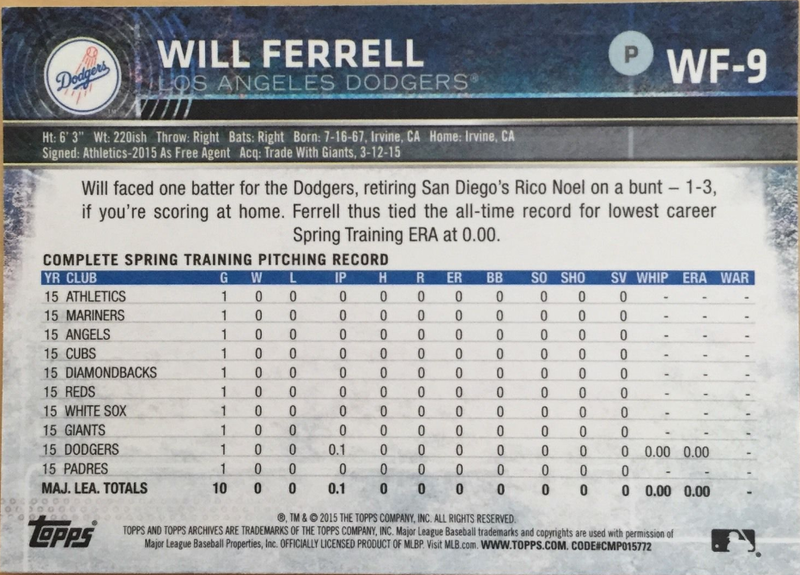 I am sure you recall Will Ferrell's Spring Training stunt last year, so naturally Topps had to make a Baseball card set celebrating it. 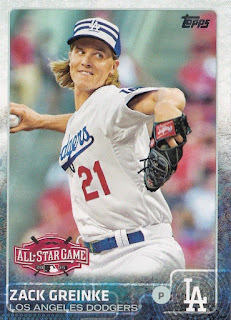 Found in packs of 2015 Topps Archives, here is the aging, yet ever hopeful, right-handed hurler in a Dodgers uniform. As you'll recall, he got out the only man he faced - on an attempted bunt for a single. 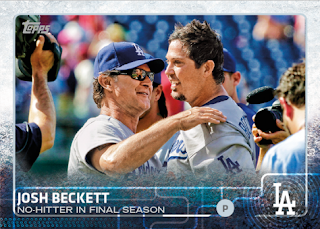 In another no-brainer pick, here is the "Dude" on a 2015 Topps Series 1 "First Pitch" insert card. You can watch his first pitch (er... bowl) here. 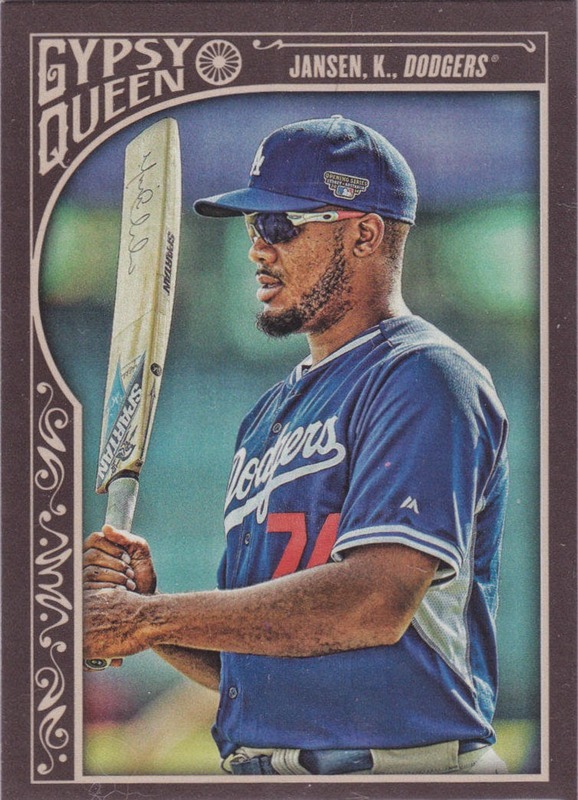 My choice as the #1 Dodgers card of 2015 is Kenley Jansen's 2015 Gypsy Queen short-printed base photo variation card showing him wielding a cricket bat during the teams exhibition series in Australia in 2014. I don't know why I think this is the best card. I just know it has struck my fancy ever since it came out. It's fun and historical. 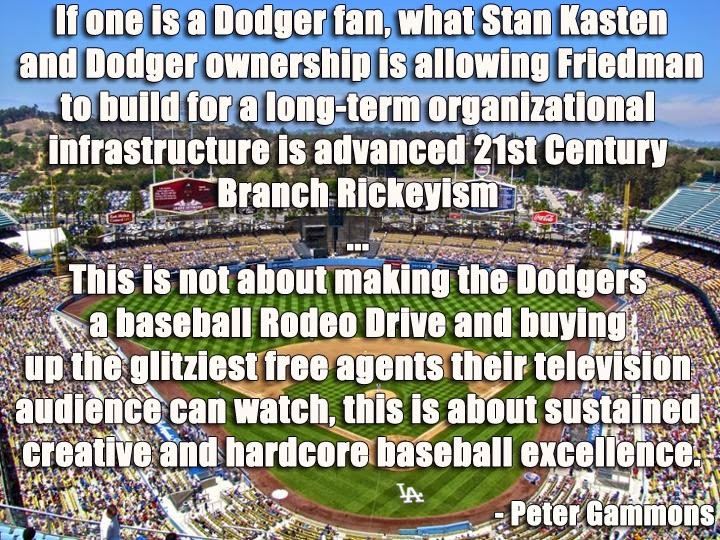 I also think it's a fascinating melding of two related sports. 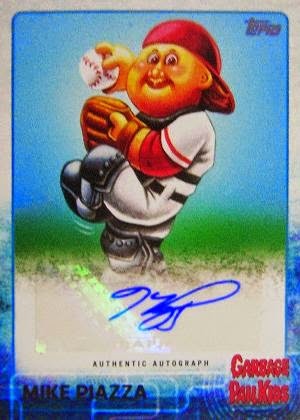 I toyed with the idea of including a Garbage Pail Kids card to my list of Top-10 favorites, but at the end of the day decided against it. 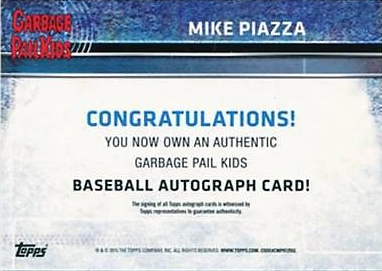 My first "Honorable Mention" card is the Mike Piazza autographed insert. This card makes me laugh everytime I see it. So does that mess of an autograph. I call the below three base cards found in packs of 2015 Topps Update the All-Star "Ugly Hat" edition. Featured below are the All-Star Game cards for Greinke, Gonzalez and Kershaw. As you can see, they all show them sporting those awful looking caps. I had written about the below two cards back in September (link here). Both of these cards, featuring BBF's Hyun-Jin Ryu and Yasiel Puig, are 2015 Topps Triple Threads "Triple Relic" cards and they spell out musically themed words. For Ryu, he sang a song titled "Smile Again" for Christmas charity project in 2013 in Korea. For Puig, his card spells out the name of a Puig-inspired grindcore band. 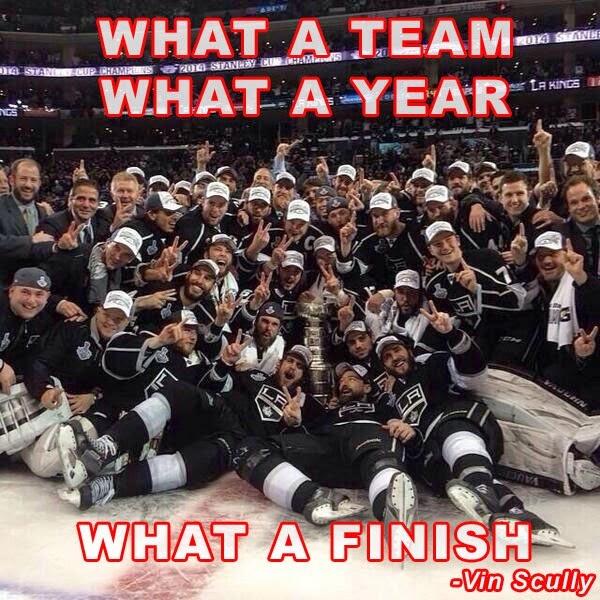 I put the below card here not because it's one of the best of 2015 - it isn't. I show this card because it is so terrible it might be great. Like... Maybe one of the great unknown cards of 2015. 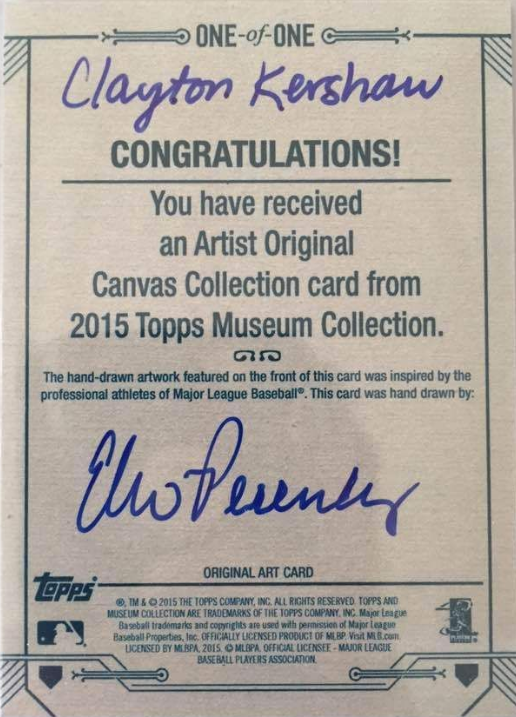 (I actually wrote about this card previously, here) Featured below is a "1 of 1" sketch card that was pulled in a pack of 2015 Topps Museum of Clayton Kershaw. I think you'll agree with me that it is an absolute mess. An haphazard, yet strangely artistic, creation that is one part dung-heap and one part comedic gold. Who ever this artist is, I tip my hat to you.